Ola Auto UK Launch Makes Waves In Liverpool! Ola Auto UK Launch Makes Waves In Liverpool! Home Newsroom Ola Auto UK Launch Makes Waves In Liverpool! The hottest thing right now on the streets of Liverpool, where the Beatles once walked is *drum rolls*- Auto Rickshaws! The closest thing we got to see an autorickshaw on foreign soil was from a Netflix series Black Mirror episode titled, ‘Hang the DJ’. Well, that future isn’t implausible anymore, Indian cab hailing service Ola has launched its fleet of green Bajaj and Piaggio autos in the United Kingdom. 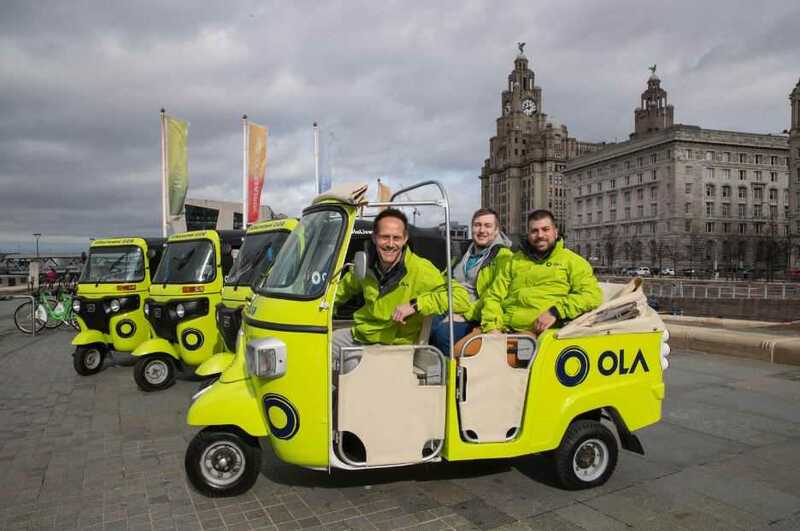 Ola Auto service launch in Liverpool, comes hot on the heels of its previous service roll out in Cardiff during August 2018. 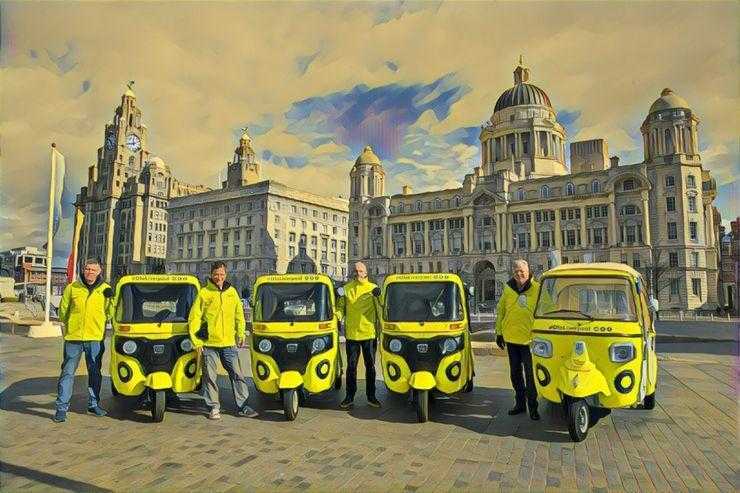 The Piaggio and Bajaj autos also called tuk tuks, have made the grand entry on British soil on March 22nd, 2019. The ride-hailing service providers had reportedly offered free rides to Liverpudlians for the entire day on 22nd March 2019. Although users can no longer avail the free ride, they can still get their hands on Ola discounts and promo codes like 50% OFF discount if they download the app and enjoy the service before the end of April. Founded in 2010, India’s popular ride-hailing service has an overseas presence in Australia, New Zealand and now the UK. Ola offers over 1 billion rides per year across 169 cities globally. Ola is no foreigner to England, as it provides services to 4 other English cities namely Bristol, Bath, Exeter, and Cardiff. Reports suggest Ola has plans to enter the ride-hailing market in other major cities in Northern England in the latter half of 2019. Starting off as a cab aggregator located in Mumbai, Ola surely has come a long way. Now, headquartered in Bangalore, India, Ola has recently raised fundings of $56 million and $300 million from Tiger Global & Matrix India, and Hyundai & Kia respectively. With acquisitions like FoodPanda and Ridlr, Ola is looking to diversify its services into the food tech and transport ticketing sectors. With the previous acquisition of TaxiForSure and recent investment in Series A funding for Vogo, Ola seems to be firmly in the driver’s seat when it comes to transportation service segment of India. Reports suggest that the Piaggio and Bajaj fleet of bright green tuk tuks in the boroughs of Merseyside, UK, has already registered over 500 drivers and the number is growing. This growth can be attributed to the lower commission rates and the enthusiasm around the launch of this new mode of transport. Managing Director of Ola UK, Ben Legg mentioned on his LinkedIn profile that he had a great time driving local Liverpudlians around the city interacting with them and understanding their transportation problems and how it can be resolved. Just like Beatles Ashram in Rishikesh, India has further strengthened ties with the city of Liverpool with the launch of Autos aka Tuk Tuks!